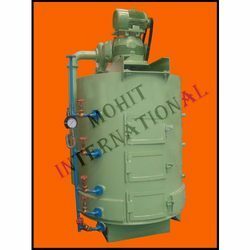 Manufacturer of a wide range of products which include copra dryer. Copra Dryer offered to find application in drying solid wet materials in batch form. The operations include loading of wet material in the chamber that also features perforated sheet or weld mesh bottom so as to permit easy flow of hot air through materials. This hot air blown into plenum chamber below platform through the use of powerful blower of hot air generator is made to pass through wet materials which help in extracting moisture from it that escapes through the opening on top. Made available in different operational capacities.